Plymouth's first workhouse dated from 1630 and was known as the "Hospital of the Poor's Portion". In 1707, Plymouth was one of the first towns to be incorporated by a local Act of Parliament, which allowed the two parishes of Plymouth St Andrew and Plymouth Charles the Martyr to unite for the purposes of poor-law administration and set up a residential workhouse. The Incorporation was managed by a body called the Guardians of the Poor which comprised the city's Mayor, Recorder, six of its magistrates, six members of the common council, twenty inhabitants of the parish of St Andrew, and 18 inhabitants of the parish of Charles the Martyr. The Incorporation took over the Poor's Portion workhouse. Plymouth Incorporation's local Act status exempted it from most of the provisions of the 1834 Act and the Incorporation continued in operation until 1930, when the Plymouth Council took over the administration of poor relief in the city. In the summer of 1849, there was a major outbreak of cholera in the city. The Incorporation workhouse in Catherine Street could not cope — it was overcrowded, badly ventilated, had only one bath and little hot water. In the same year, there was a scandal in the local newspaper concerning the undignified treatment of a the body of the Mrs Henrietta Beer who had died in the workhouse. 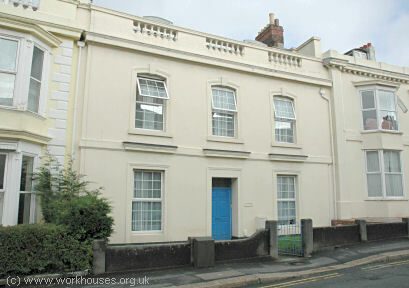 The Incorporation's Board of Guardians decided that the old workhouse needed to be replaced. Land had already been earmarked for such a scheme on a four-acre site at Specott's Fields near Freedom Park near the recently erected Borough Prisons. At the west of the site, at the junction of Longfield Place and Greenbank Road was a building latterly known as Greenbank House which may have contained the Guardians' offices. The main workhouse building was a three-storey structure at the centre of the site. The workhouse had very extensive gardens in which the inmates cultivated vegetables which on one occasion amounted to 20,000 leeks and 11,000 cabbages. In 1894, the British Medical Journal set up a "commission" to investigate conditions in provincial workhouses and their infirmaries. Following a visit to Plymouth, the commission's report found much to criticise about the workhouse infirmary. The wards were small and numerous and spread over three floors; the staircases were steep, and the passages narrow. No piped hot water was laid on — it had to be carried in buckets from a sunken hot-water tank in one of the courtyards, described by the reports as "a very dangerous and unsatisfactory contrivance". The labour ward was the first floor in the main part of the workhouse; it was small, lacked privacy and, when going into labour, women had to climb up the stairs from the ward below. Two nurses were employed, of whom only one was formally trained. They were assisted by pauper inmates who also provided the only night-time cover. The commission recommended the building of a new infirmary and a doubling of the nursing staff, with trained nurses being employed during the night. Further details are available in the full report. The Plymouth Board of Guardians, at their last meeting, adopted a recommendation of the Visiting Committee for the increase of the nursing staff at the workhouse by the appointment of a superintendent of nursing at £50 per annum, a certificated hospital nurse for the male wards at £25, and also one trained nurse for each set of wards at £20. Dr. Oxland protested against the decision, and handed in a notice of motion to rescind it. A variety of other buildings were subsequently added to the workhouse site including an isolation/smallpox hospital, venereal ward block and maternity block. In 1907-10 a major development of hospital facilities took place to the east of the workhouse with the erection of two large ward blocks, an administration block and a nurses' home. The latter accommodated 21 nurses and included a special room for the storage of bicycles. 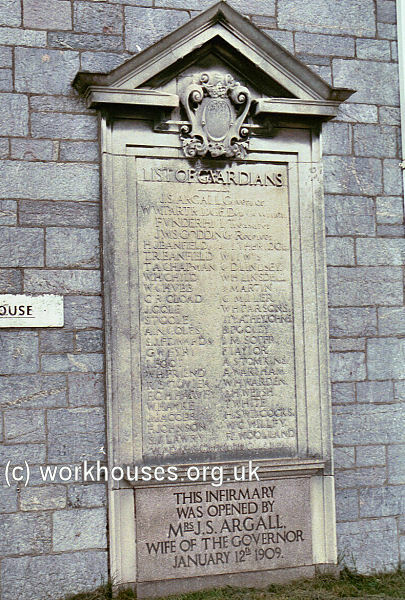 Plymouth workhouse infirmary foundation plaque, 2001. 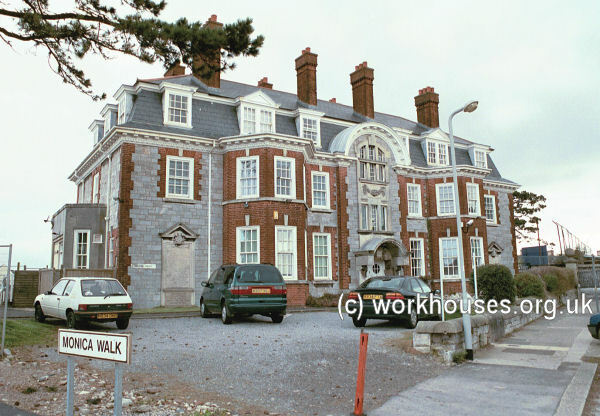 Plymouth workhouse nurses' home, 2001. From 1909 to 1929, the hospital facility was known as Greenbank Infirmary. In 1930 the site became known as Plymouth City (General) Hospital. Within a few years, all of the city's hospitals were amalgamated under the umbrella name of the Prince of Wales Hospital. In 1951, shortly after the inauguration of the National Health Service, the former workhouse site became Freedom Fields Hospital. The site was redeveloped as a housing estate in 2000 and virtually all the hospital buildings have now been demolished. A Central Home at 13 Hill Park Crescent administered the system and processed new arrivals. Central Home at 13 Hill Park Crescent, 2005. 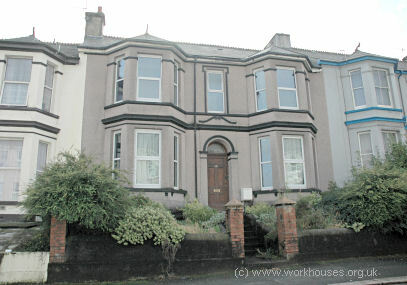 Scattered Home at 168 Alexandra Road, 2005. Plymouth and West Devon Record Office, Unit 3, Clare Place, Plymouth PL4 0JW. Most of local records were destroyed by enemy bombing in 1941. Holdings include: Board and Committee minutes (1909-1930); Poor Law Board and Local Government Board correspondence 1851-19145.